D- was going to a football draft meeting turned potluck lunch a few weeks ago. When he told me about it, I was first excited about going to his drafting because I always wanted to see how that goes. But then immediately after that thought, I said “Let’s make dessert!” I am always in the mood to make cupcakes, but I never really have a reason to make them, so this was the perfect opportunity. 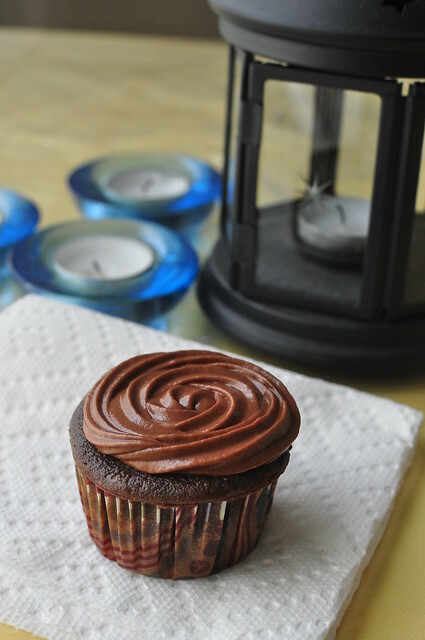 I went browsing through my cookbooks one night and found the perfect cupcake recipe in Flo Braker’s book. I found this book at a Half Price bookstore for a great price of $9.99! It has a chapter on baking basics and then the book is broken down into different occasions. It’s quite funny how I look for recipes. I think of what is in my kitchen first and see if I can use those up first. I suppose it’s not that funny, more like practical. But it makes me really sad when food goes bad, so I must think that way. I just must! I decided to make them in cupcake form instead of the suggested 6 inch cake just because it would be easier to transport. I was so excited because I got to use this again! 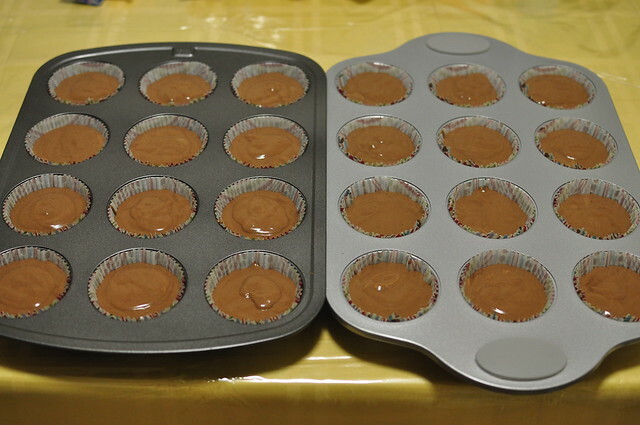 I loved how the cupcakes turned out, even though the frosting looks like I spread it. I totally made use of my piping materials. I’ve got to say I can definitely improve on my piping skills. It is basically consisted of starting in the middle and working my way out. After that, the result slightly varies. I used the frosting recipe that accompanied the recipe in the book. It had a more liquid consistency than you want for piping, so I was afraid the texture of the piping wouldn’t hold up, but it still looked pretty good. I always end up with more frosting every time I make it from scratch. 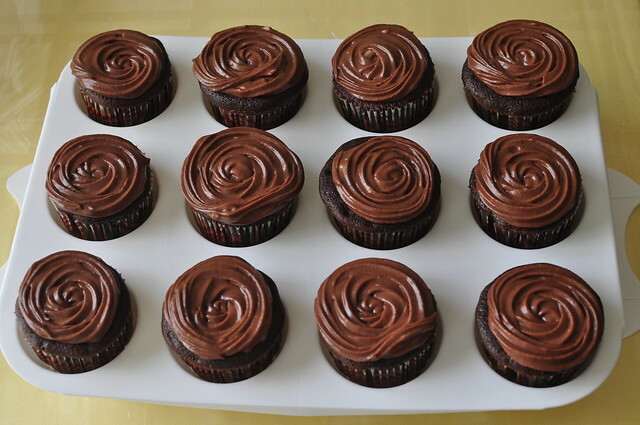 I like my cupcakes to have a good frosting-to-cake ratio, and I think I got the ratio down. However, I was left with a bowl filled with frosting. I have no clue what to do with it now. I’ve been using it as the icing in cookie sandwiches. Anybody else got any ideas for leftover frosting? As for the overall taste, I would have to say this is my favorite chocolate cake by far! The frosting wasn’t overpowering the cake and the texture of the cake was so light and fluffy. I was amazed on how flavorful it was for being so air-y. All 24 cupcakes were gone by the time everyone drafted their team members for this football season, which makes me so happy! I’m definitely adding this recipe to my baking repertoire. Here’s to D-‘s team winning! 6 ounces (1½ sticks/170 grams) unsalted butter, at room temperature. 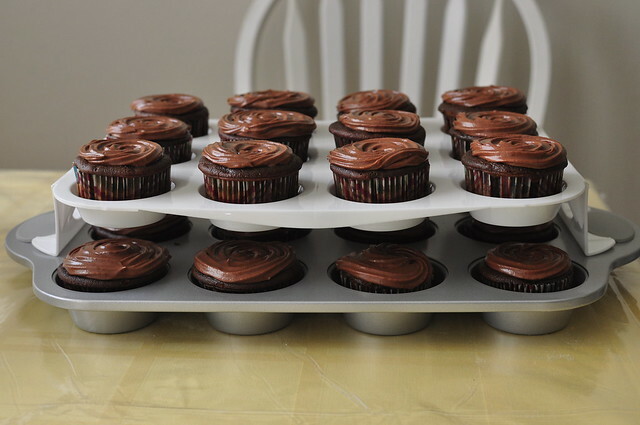 Center a rack in the oven and preheat the oven to 350 degrees F. Line your cupcake pan with paper liners. Have all the ingredients at room temperature. Half fill a bowl with hot water (120 degrees F). Put the chocolate in a bowl and place it over (but not touching) the hot water. Let the chocolate melt until creamy and smooth, stirring slowly occasionally. (Replace the water with more hot water, if needed to melt the chocolate smoothly.) Remove from the water bath and set aside to cool to lukewarm. Sift together the flour, baking soda, and salt onto a sheet of waxed paper; set aside. In a small bowl, stir together the sour cream and vanilla; set aside. In the bowl of a stand mixer fitted with the paddle attachment, beat the butter on medium speed until it is lighter in color and creamy, clings to the sides of the bowl and has a satiny appearance, about 45 seconds. Add the sugar in a steady stream, stopping the mixer occasionally to scrap down the sides of the bowl. Continue to beat on medium speed until the mixture is very light in color and fluffy, 3 to 4 minutes. With the mixer on medium-low speed, add the eggs, 3 to 4 tablespoons at a time, beating after each addition until incorporated and stopping the mixer occasionally to scrape down the sides of the bowl. Continue to beat on medium-low speed until the mixture is well blended and lighter in color and texture, 3 to 4 minutes. Stop the mixer occasionally to scrape doen the sides of the bowl. On the lowest speed, add the melted chocolate, and then add the flour mixture in three additions alternately with the sour cream in two additions, beginning and ending with the flour mixture and mixing after each addition until incorporated. Stop the mixer and scrapes down the sides of the bowl after each addition. Detach the paddle and bowl from the mixer, and tap the paddle against the side of the bowl to release the excess batter. Slowly add the warm coffee (I used warm water), stirring with a rubber spatula until smooth. Spoon the batter into the liners. Bake the cakes until the tops spring back when lightly pressed with a fingertip and a round wooden toothpick inserted in the center of each cake comes out free of cake, about 20 minutes. Transfer to wire racks and let cool. To store, wrap each cake layer in plastic wrap and store at room temperature for up to 2 days. For longer storage, overwrap with aluminum foil, label with the contents and date, and freeze for up to 1 month. Thaw at room temperature for about 2 hours before unwrapping and frosting. 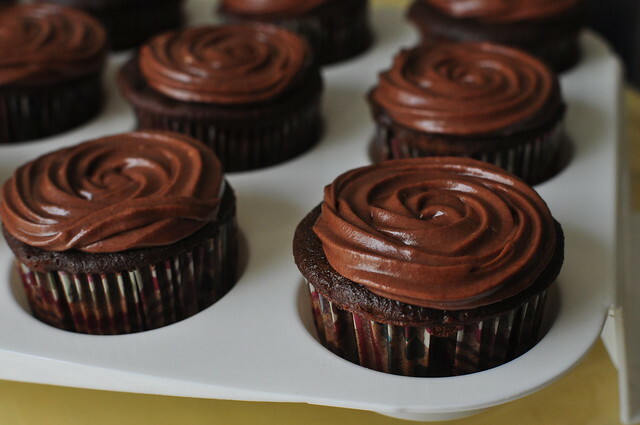 This entry was posted in Cupcakes, Recipes and tagged baking, cakes, chocolate, cupcakes, frosting, recipes on September 20, 2012 by Krystal.